GGlobal Suhaimi was incorporated in 1976 as a Saudi-Foreign joint venture specialised in coatings applications. Over the years since then, its highly-skilled, multi-national workforce performed in full compliance with the original group quality system and later adopted ISO 9001:2000 quality management standards by TUV-CERT in 1996. The company’s professionals strive to provide high quality and cost effective expert services with in-house specialised development and training on pipeline integrity, construction, fireproofing, flake lining and coating including both hot and cold insulation. For nearly 40 years, Global Suhaimi has been a leading provider of industrial asset protection, traffic engineering, and professional development services in the Middle East. Global Suhaimi has expertise in corrosion and fireproofing solutions for pipelines, refineries, power plants, desalination plants, above/underground storage tanks and equipment in the industrial market of energy and resources, water, concrete, infrastructure, building and warehouse structures. The expertise also extends to road and airfield pavement marking and traffic engineering along with the professional development through various certification programs. Currently the company has over 3000 employees’ highly qualified and trained cadres carrying numerous years of diversified pertinent experience, who are the essential partners of the company’s success. 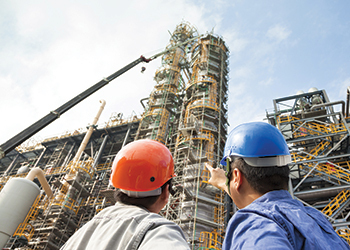 Industrial services: Global Suhaimi has built & sustained a reputation as one of the leading maintenance and corrosion protection companies in the Gulf. The company specialises in protection of steel and concrete structures in one of the harshest environments in the world. As a specialist contractor in the field of surface preparation and protective coatings, Global Suhaimi is very active in the oil, gas, petrochemicals, water desalination, power and communications sectors. 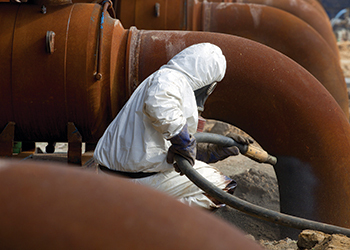 Protecting customers’ valuable assets from rust, corrosion, and fire – all of which can drastically reduce the productive life of these expensive assets. The company is continuously developing a workforce of highly qualified Saudi and foreign engineers who supervise experienced site crews throughout the Gulf region. All company professional staff & employees have had extensive technical training and many years of experience. • Airport and Road Marking with thermoplastic & Poly Urea paints, cat-eyes, ceramic studs, traffic & informative signs, curbstone painting, antiskid surfacing. • Traffic & Crash Barriers, Traffic cones, Traffic safety apparel, Road Marking machines, etc. Trading & Commercial Services: As a Group that constantly offers top quality products, Global Suhaimi has always laid great emphasis on owning and using state-of-the-art technology & equipment along with quality materials. Focusing on customer satisfaction and ensure that the customer is always the first priority. The competitiveness of any business often rests on the quality and skills of its workforce. Proper staffing can improve the performance and productivity and ensure they have the professional skills that business needs. With this perspective, Global Suhaimi supports its clients to recruit the best suitable candidate with the required skills and expertise to support their business by understanding the need of the business and client. Global Suhaimi supplies high performance abrasives and related products to suit all applications. With a commitment to working closely with customers to understand and fulfill specific requirements, a wide range of products are provided namely Garnet. As GSC is a leader in the Protective Coating, Insulation and Fireproofing industry, we secure more than 20% of the market share in Saudi Arabia. During the past few years, Oil prices has negatively impacted the regional economy especially Saudi market. Many of the projects have been suspended and the overall governmental spending has been dramatically reduced. However, Global Suhaimi has shown growth during these period of time due to the strategic plan adopted by the company and a proactive action towards the industry concerns. GSC anticipates the same level of growth in the upcoming years. The crux of which lies in diversified business approach implemented to become an integrated service provider and achieve the company long term vision of becoming the market leaders in the multi-service contracting industry in line with Saudi Vision 2030. Accordingly, Global Suhaimi has established several joint ventures with different internationally recognised organisations. Suhaimi Hantech: Suhaimi Hantech, an established joint venture between Hantech Ltd. – Seoul and Global Suhaimi to provide Engineering services, procurement and industrial construction activities in the Kingdom of Saudi Arabia. For almost 40 years, Hantech has been a true pioneer in the role of engineering and fabricating chemical plant equipment and plant facilities with continuously grown over the years to meet the demands for high quality and high performance. NES Global Arabia Limited: NES Global Arabia Limited is a joint venture between Global Suhaimi and NES We provide a complete range of global talent solutions to the oil and gas, power, infrastructure, chemical, life sciences and rail sectors worldwide. Offering far more than a traditional recruitment service, our comprehensive set of guaranteed staffing solutions ranges from payroll administration to full recruitment process outsourcing. Established over 35 years ago, with more than 40 offices in 26 countries and over 500 specialist staff and discipline specific consultants, we are able to support our clients with all of their global talent requirements and our candidates with finding the best in global job opportunities. GIWI: GIWI is a joint venture between Global Suhaimi and IWI which has developed the Pipe Spool Auto Fabrication System (PAS) based on the various years of experience and knowhow. This new method, gives you high quality product maintains simpler management, higher efficiency and higher safety standards. GIWI’s well trained and highly experienced managers, staff and engineering supervisors also ensure our clients of complete satisfaction regarding costs and the high quality of work throughout the construction period. Garnet Arabia Company (GAC): Garnet Arabia Company (GAC), an established joint venture between GMA Australia the best grade quality Garnet exporter worldwide & Global Suhaimi in the field of Garnet processing and recycling. Garnet is used for abrasive blasting, water jet cutting and many more. GAC processing plants located in Jubail Industrial City started operation officially on December, 2006 with production capacity of 50,000tn/year.